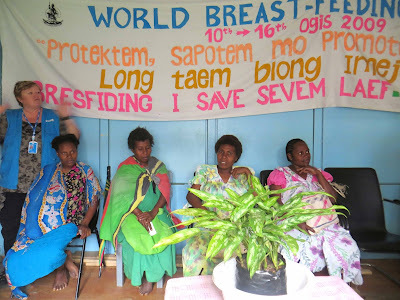 Pacific Island Countries: Breast is best: maternal and child health in Vanuatu. Breast is best: maternal and child health in Vanuatu. 5:30 am start this morning from Port Vila, the capital of Vanuatu, for a 6:00 am flight on a 20 seat Harbin Y12 Propeller to Tanna. There is the usual friendly bustle of passengers taping and tying up their luggage bundles, and asking other passengers to carry some of their overweight pieces. A Canadian doctor who rushed over last night with a medical evacuation case begs for a seat to return so she can do her dispensary visits today. We stand by to carry some medical supplies in case she cannot get on, but at the last minutes she does. I love the peace and beauty of flying over the vast expanse of Pacific Ocean, but I reflect on the difficulties of bringing health and social services to such a widely distributed population. Vanuatu is "only" 83 islands; the distance between the two outermost islands is 1300 kilometres. The maternal and child health (MCH) wards and clinics of Port Vila hospital are basic, but not lacking in essentials, and everything is well organised, spotlessly clean, with an atmosphere of friendly efficiency. The MCH services and facilities at the Tanna hospital are not bad, but clearly there are support needs. And this, colleagues tell me, is one of the better Provincial facilities. (Good news: the Ministry of Health has just launched a decentralisation process, to spend more resources with more staff at Provincial level). We spend some time in the antenatal clinic, where women sit comfortably under an old, colourful banner promoting breastfeeding. Later in the day we will visit a rural health post, and spend time with the mothers bringing their babies and toddlers for the post-natal check-ups and vaccinations. We greet the pregnant women, some of whom are there with toddlers: “Halo evriwan specially pikinini” (Hello everyone especially the children.) 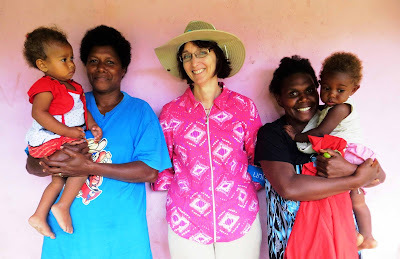 They have a rather long wait as the hospital is understaffed, and unlike in Port Vila, there is not a dedicated volunteer who counsels on how to breastfeed and on kangaroo care, which means keeping baby close to mother’s body immediately after birth. I admire that these women think the long wait for a nurse is worth their time. I know very well that their time is valuable to the entire family as they run large, labour intensive households, do subsistence or cash farming, and sell and buy in town on market days. Because they have many children, are very busy, and because they like to be modern in some things, there is strong temptation to wean babies too soon and give them cheap but inappropriate foods such as sugary biscuits. UNICEF has provided training and an easy-to use and understand laminated flipchart on child feeding from birth to two years, focusing particularly on “breast is best up to six months of age” and nutritious weaning and toddler foods that are locally grown. UNICEF Vanuatu continues to support exclusive breast feeding through the Baby Friendly Hospital (BFH) Initiative where Vanuatu hopes to achieve BFH accreditation in at least 3 hospitals by the end of 2014.